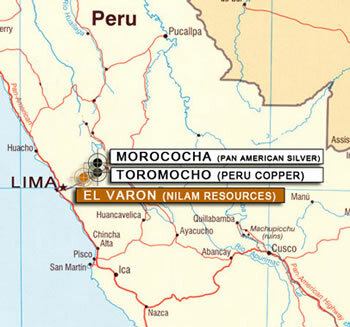 EL Varon project consists of "Tati" and "San Marino No.2" mining concessions. The laboratory analysis shows rich poly-metallic mineral deposits rich in Gold, Silver, Copper, and Zinc metals. Three veins rich in Gold, Silver, Copper and Zinc metals. The planned monthly output is 4,000 tonnes / month. The production is expected to grow to 6,000 tonnes / month. In the last five years, the value of Peru's mineral production has grown by nearly 25 per cent. The gold production increased by 20%, and gold exports generated more than $4 billion in revenue. El Varon already has the necessary infrastructure for mining operations, including electricity, proximity to water and accessible transportation.